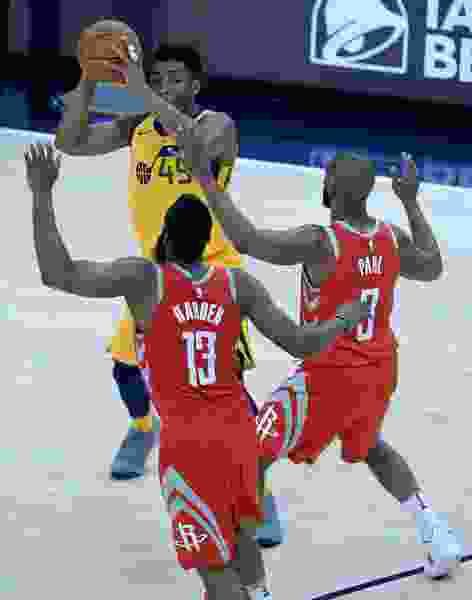 (Francisco Kjolseth | The Salt Lake Tribune) Utah Jazz guard Donovan Mitchell (45) faces a wall with Houston Rockets guard James Harden (13) and Houston Rockets guard Chris Paul (3) in Game 4 of the NBA playoffs at the Vivint Smart Home Arena Sunday, May 6, 2018 in Salt Lake City. Houston took a 3-1 series lead over the Jazz with a final score of 100 to 87. “Maaaan. It’s freeezing in Salt Lake City. This can’t be normal,” Harden tweeted. It’s true, it has been frigid in Utah’s state capital this week. But the Rockets are no strangers to cold streaks; after all, they’re going through one themselves. The Rockets stand at 13th place in the Western Conference, with just an 11-12 record so far this season after amassing a 65-17 record last season. Given that they’d have to go 54-5 the rest of the way to match what they accomplished last season, they’ve probably clinched a regular-season regression. And on Monday, they suffered a shocking loss in an even colder climate, scoring just 29 points in the second half thanks to icy shooting in a 12-point defeat to the Minnesota Timberwolves. The Rockets have reasons for their disappointing start. Chris Paul was suspended by the NBA, and James Harden and Eric Gordon both suffered injuries that kept them out for multiple games at different points in the season. At first, there was the problem of Carmelo Anthony being bad in his minutes on the court, and now that he’s been waived, there’s the problem of getting better play from the other players who play those minutes. And of course, there’s the fact that it’s just a different team than last year. Trevor Ariza went to Phoenix, Luc Mbah a Moute signed a contract with the Clippers. Ryan Anderson was traded to the Suns, along with potentially helpful second-round pick De’Anthony Melton. The depth that the Rockets could rely on last season isn’t around anymore. Some of their stars have regressed somewhat, too. Harden, to be clear, is an exception, having another terrific season and even scoring slightly more than last year, up to 30.6 points per game. The newly re-signed Clint Capela is scoring and defending well too. But Paul hasn’t looked completely right so far, and Gordon is shooting a catastrophic 36 percent from the field. Right now, teams that have stopped the Harden and Capela pick and roll by leaving the other three guys on the court have found success. In that context, they face a familiar Jazz team for the second time in 2018-19. Of course, these teams know each other from the five-game Western Conference semifinal series that happened seven months ago. But there’s an extra bit of competition gained by how well the stars of the two teams know each other. Utah’s Donovan Mitchell spent time with both Paul and Harden this summer. Harden and Mitchell filmed a commercial together in Barcelona, and Paul worked out extensively with Mitchell as they both sought to improve their games. So yes, the stars of these two teams like each other. But with both teams fighting for spots in an uber-compressed West — with 14 teams within five games of each other — they know this battle is important. Friendship and competitiveness? Maybe the Thursday night game at Vivint Arena between these two teams won’t be so chilly after all. Tipoff • Thursday, 8:30 p.m.
About the Jazz • Guard Grayson Allen was sent to the SLC Stars after appearing on the inactive list against San Antonio on Tuesday. ... Every Jazz player shot 50 percent or better from three in Tuesday’s game against San Antonio. About the Rockets • Zhou Qi is day-to-day with a left ankle sprain. ... James Harden is leading the NBA in points per game again this season with 30.6. ... Clint Capela is averaging 18.1 points and 11.8 rebounds per game after signing a $90 million contract this summer.